Journal of Nanjing Agricultural University, 2019, 42(2): 300-307. 杨德坤, 颜成, 邬振江, 等. 鸟粪石结晶法去除餐厨沼液中氨氮的研究[J]. 南京农业大学学报, 2019, 42(2): 300-307. Abstract: [Objectives] In this paper, struvite crystallization approach was used to treat anaerobically digested food-waste slurry in order to recover ammonia nitrogen. [Methods] We investigated the effects of temperature, the reaction time, initial pH value, and the molar ratio of magnesium to phosphorus to nitrogen on the recovery of ammonia nitrogen by struvite crystallization approach. Furthermore, struvite crystallization effectiveness of keeping a constant pH value throughout the trial and only adjusting initial pH value were also compared in the study. [Results] The results showed that adjusting initial pH value instead of keeping constant pH value was beneficial to removing or recoving ammonia nitrogen due to the struvite formation of a higher purity. 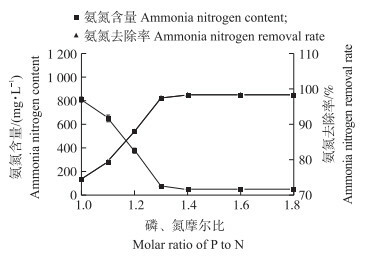 Optimum parameters including reaction temperature of 28℃, initial pH of 9.0, the reaction time of 90 min, and the mole ratio of magnesium, phosphorus and nitrogen with 1.43:1.3:1 were observed for obtaining the highest removal efficiency of ammonia nitrogen, and the main component of the precipitate was identified as struvite by detection. 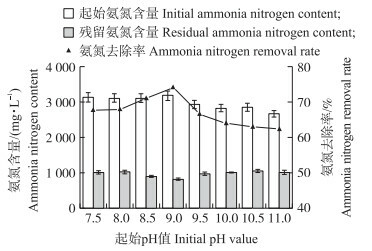 [Conclusions] Under the optimal conditions, the removal rate of ammonia nitrogen can reach 98%. After struvite crystallization, the residual ammonia nitrogen and phosphate in anaerobically digested food-waste slurry were drastically reduced to 48.74 and 35.35 mg·L-1, respectively. As a result, the ratio of the chemical oxygen demand(COD) to total nitrogen content(TN) in slurry was enhanced by about 8 times, which would improve subsequent wastewater purification by activated sludge process. 注: w:质量分数Mass fraction; x:原子数分数Atomic fraction. 刘立凡, 廖永伟, 梁捷, 等. 我国餐厨垃圾处理技术与研究进展[J]. 广州化工, 2014, 42(4): 41-43. 李强. 三相离心机在餐厨垃圾分离行业中的应用[J]. 过滤与分离, 2017, 27(3): 34-36. 闫雨, 阳艾利, 魏小凤. 我国餐厨垃圾处理技术及市场现状分析[J]. 环境卫生工程, 2017, 25(1): 17-20. 陈满英, 路风辉, 刘敬勇, 等. 餐厨垃圾处理技术及资源化利用研究进展[J]. 广州化工, 2018, 46(4): 13-16. Li W, Ding X W, Liu M, et al. Optimization of process parameters for mature landfill leachate pretreatment using MAP precipitation[J]. Frontiers of Environmental Science & Engineering, 2012, 6(6): 892-900. 杨鸿瑞, 朱洪光, 周雪飞, 等. 投药方式对鸟粪石法脱氮除磷的影响[J]. 环境工程学报, 2011, 5(1): 55-59. Yang H R, Zhu H G, Zhou X F, et al. Influence of agent adding mode on ammonia and phosphorous removal through struvite precipitation[J]. Chinese Journal of Environmental Engineering, 2011, 5(1): 55-59 (in Chinese with English abstract). 张记市, 王玉松. 鸟粪石结晶法回收垃圾渗滤液氨氮研究[J]. 环境工程学报, 2009, 3(11): 2017-2020. Zhang J S, Wang Y S. Struvite crystallization for recovering ammonia nitrogen from landfill leachate[J]. Chinese Journal of Environmental Engineering, 2009, 3(11): 2017-2020 (in Chinese with English abstract). 佟娟, 陈银广. 剩余污泥水解酸化液磷去除的影响因素研究[J]. 环境工程学报, 2007, 1(4): 1-5. 白晓凤, 李子富, 闫园园, 等. 吹脱与鸟粪石沉淀组合工艺处理中温厌氧发酵沼液研究[J]. 农业机械学报, 2015, 46(12): 218-225. 吴健, 平倩, 李咏梅. 鸟粪石结晶成粒技术回收污泥液中磷的中试研究[J]. 中国环境科学, 2017, 37(3): 941-947. Wu J, Ping Q, Li Y M. A pilot-scale study on struvite pellet crystallization for phosphorus recovery from sludge liquor[J]. China Environmental Science, 2017, 37(3): 941-947 (in Chinese with English abstract). Aage H K, Andersen B L, Blom A, et al. The solubility of struvite[J]. Journal of Radioanalytical and Nuclear Chemistry, 1997, 223(1/2): 213-215. 李咏梅, 刘鸣燕, 袁志文. 鸟粪石结晶成粒技术研究进展[J]. 环境污染与防治, 2011, 33(6): 71-75. Zhou S, Wu Y. Improving the prediction of ammonium nitrogen removal through struvite precipitation[J]. Environmental Science & Pollution Research, 2012, 19(2): 347-360. 黄颖, 林金清, 李洪临. 鸟粪石法回收废水中磷的沉淀物的组成和晶形[J]. 环境科学学报, 2009, 29(2): 353-359. 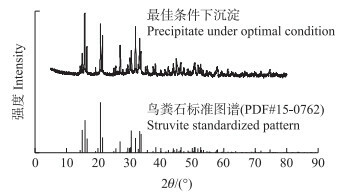 Huang Y, Lin J Q, Li H L. Study on the composition and crystal shape of the precipitate obtained by struvite precipitation from wastewater for phosphorous recovery[J]. Acta Scientiae Circumstantiae, 2009, 29(2): 353-359 (in Chinese with English abstract). 董滨, 段妮娜, 何群彪, 等. 鸟粪石结晶法处理猪场污水的研究现状及发展趋势[J]. 水处理技术, 2009, 35(8): 5-8. Dong B, Duan N N, He Q B, et al. Status and development of struvite crystallization for swine wastewater treatment[J]. Technology of Water Treatment, 2009, 35(8): 5-8 (in Chinese with English abstract). 余荣台, 丁丽丽, 任洪强, 等. 磷酸铵镁化学结晶技术研究现状[J]. 工业用水与废水, 2014, 45(6): 1-3. 冯皓迪, 丁一珊, 崔梦萦, 等. MAP法沉淀回收尿液中氮磷的研究[J]. 环境工程, 2016, 34(增刊1): 162-166. Feng H D, Ding Y S, Cui M Y, et al. Recovery of nitrogen and phosphorus in urine by magnesium ammonium phosphate crystallization[J]. Environmental Engineering, 2016, 34(Suppl 1): 162-166 (in Chinese with English abstract). Wang C C, Hao X D, Guo G S, et al. 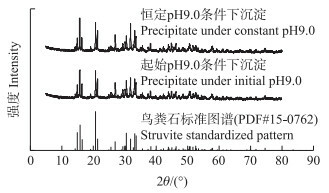 Formation of pure struvite at neutral pH by electrochemical deposition[J]. Chemical Engineering Journal, 2010, 159(1/2/3): 280-283. 成雪君, 王学江, 王浩, 等. 载镁天然沸石复合材料对污水中氮磷的同步回收[J]. 环境科学, 2017, 38(12): 5139-5145. Cheng X J, Wang X J, Wang H, et al. Simultaneous recovery of nutrients from wastewater by mesoporous MgO-loaded natural zeolital[J]. Environmental Science, 2017, 38(12): 5139-5145 (in Chinese with English abstract). 商敏儿, 杜树新, 吴铁军. 活性污泥法污水处理过程自动控制的研究现状[J]. 环境污染治理技术与设备, 2002, 3(1): 83-87. Shang M E, Du S X, Wu T J. An induction of control strategies for activated sludge wastewater treatment[J]. Techniques and Equipment for Environmental Pollution Control, 2002, 3(1): 83-87 (in Chinese with English abstract). 王庆, 丁原红, 任洪强, 等. 高浓度氨氮对活性污泥性能的影响[J]. 工业用水与废水, 2012, 43(2): 13-16.